Fashion Chokers 2017: Best Jewelry For You | KSISTYLE! Girls are interested in the question: are chokers fashionable in 2017? 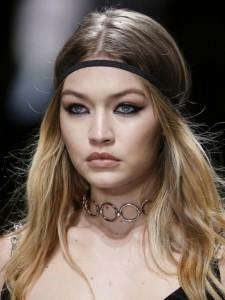 Do you want to know which chokers should be chosen in the new season? Are they used in fashion shows? What do the Hollywood stars think about them? Indeed, the choker has been popular for several years! Maybe it’s already tired of women? We looked a lot of podium photos and made an accurate conclusion: the choker remains fashionable in 2017! Designer houses add this jewelry to modern images! So, girls, your favorite choker remains relevant this year too. 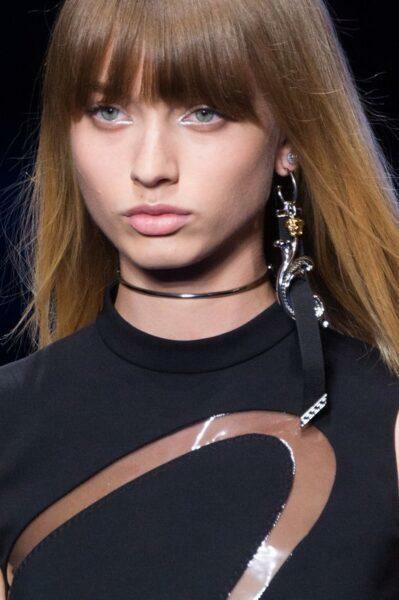 What are the main features of the choker on the neck of 2017? The choker is a jewelry, which tightly surrounds the neck. There are many varieties of stylish jewelry. There are several popular varieties in 2017, both modest and large. 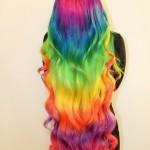 So every girl will be able to choose her own version, which will correspond to the nature and style of clothes. - The choker became «bolder» than last year! Fashion for the chokers periodically returned. From time immemorial it was a male lace-amulet of male hunters, which protected them. For some women, it is now a kind of amulet. Later choker became interested in noble ladies, making it part of their festive outfits. It is turned into a very refined and luxurious jewelry, made of shiny stones. 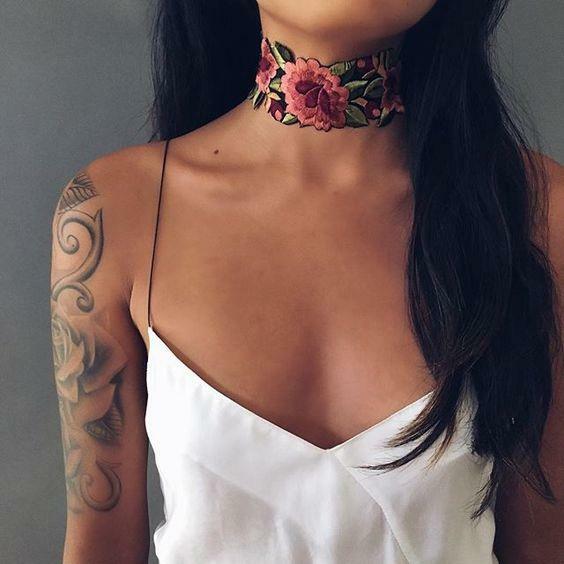 Today, 90th years are returning to fashion — the times of popularity of a thin tattoo-choker. But the modern choker is already a more visible accessory. Moreover, it can be made from large elements, which can no compared to tattoos. We have already talked about the popularity of leather as a material in 2017. So, the most fashionable chokers for everyday life are leather choker, one or several times covering the neck. The ends of the choker can be tied to a bow or freely hang down. Such a choker can be worn with everyday clothes: blouses, dresses and shirts that have a V-neck. To t-shirts and other things with a round neck, a thin braided leather choker is more suitable. If you like more extensive accessories — pick up a wide leather chokers with a heart or ring. They are popular in the new season too. Read all the secrets about what to wear a choker in our previous article. Munsoo Kwon Seoul Spring 2017 collection. Lace was named the trend of 2017. On the pages of our site, we have already published a long list of things that are created in a delicate openwork version. Therefore it is not surprising that the lace choker became such popular. Depending on the size of the decoration and the wealth of patterns, you can choose an option for everyday life, and for holidays. 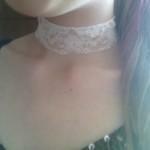 See the detailed photo-instruction on how to make a lace choker diy. 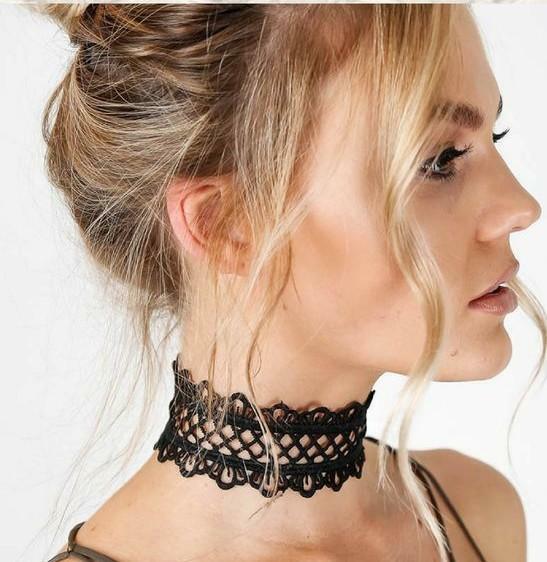 The lace choker, the photo of which is presented below, is suitable for an open-work dress — the trend of 2017. The image is very feminine and seductive. And decoration plays an important role in its creation. Rich velvet competes with metal and lace on the catwalks. There are as many devotees of noble royal material as they were last year. The general trend of increasing the size of the choker touched this variation of decoration. Velvet ribbons are much wider. A simple scheme for creating a choker from a velvet ribbon is in one of our previous posts. Metal jewelry has a different width. Thin chokers are the most modest variation. And for the bravest women of fashion, there are more spectacular models. The most spectacular version of the choker is a beautiful necklace, tightly encircling the neck. In the list of trendy accessories 2017 the choker is the leader. The jewelry is made with many small details. Such a work of art can be made from multi-colored elements or in one shade, from shiny stones or metal links. Necklace-choker has a noticeable size. 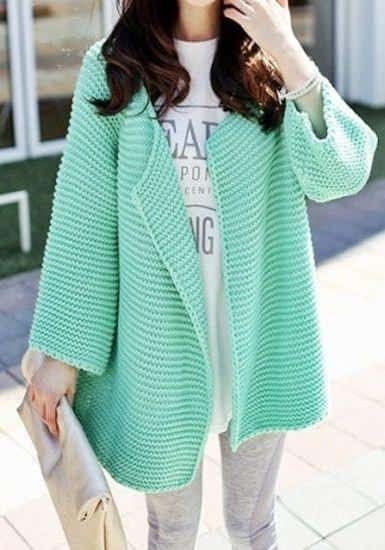 It will suit both colorful outfits and print dresses. Large items, balls, spikes — that’s what the craftsmen use to make the choker. Effectively, even boldly! 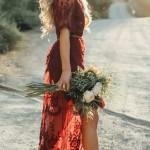 Recall that such an ornament is appropriate in the outfit only if there is a decollete or open shoulders. Plant motifs are approved by fashion trends of 2017. To ensure that such an ornament is not lost on the general background, wear it to monophonic blouses and tops. Flowers can be made in different techniques: textiles or beads. Fashion 2017 argue that the chains around your neck can be larger! it has different configurations of indiscreet (!) sizes. It is a noticeable trend in fashion shows. 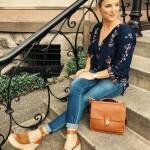 It is quite possible to embody in stylish outfits for every day. 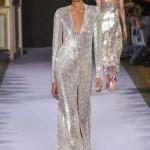 Fashion welcomes glittering elements, glitter, gold and silver and other shiny details. 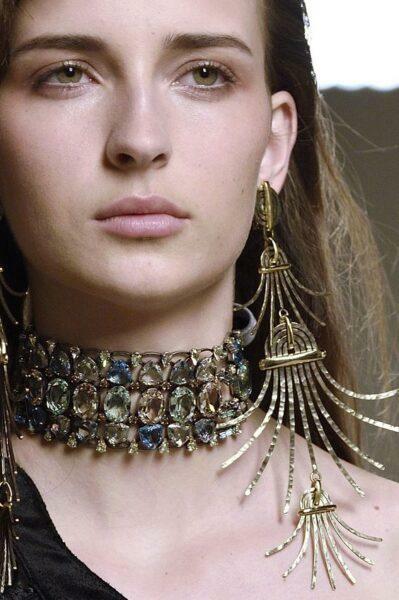 Therefore, boldly decorate the neck not only with modest chains, but also with wide shimmering chokers. And get ready for the avalanche of admiring glances. One of the main advantages of this jewelry is that it make the neck thiner. With thin threads hanging down, the wide choker looks more refined and softer. 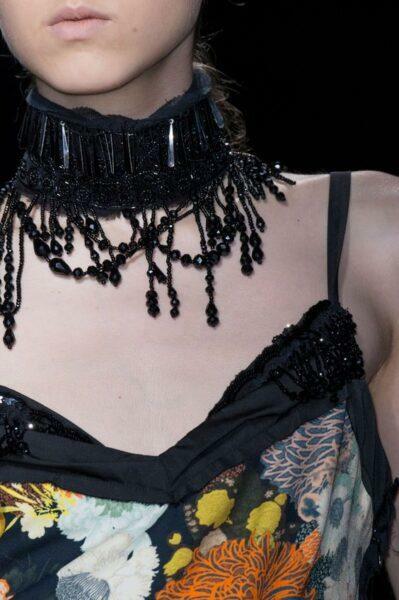 The choker can be transformed into a real work of art. Exquisite decoration of smooth beads or natural stones will suit even by evening outfit. As you can see, designers do not prohibit combining such a noticeable accessory with the same large earrings. We draw a conclusion: be bolder with decorations in 2017. Do you want to know which of the stars like a chokerchoker jewelry? See the review of photo stars in the post of our authors!